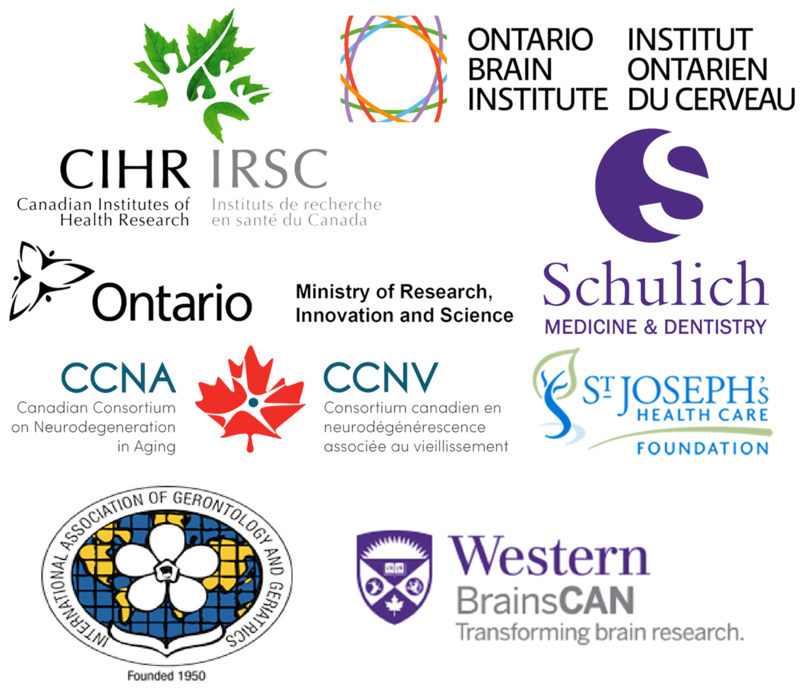 In 2007, under the leadership of Dr. Montero-Odasso, the Gait and Brain Seminars were initiated at the Division of Geriatric Medicine, the University of Western Ontario. The main objective of these seminars is to highlight the entangled relationship between gait and cognition in older adults and to emphasize the importance of gait disturbances as an early predictor of disability, frailty and dementia. These seminars are of interest to geriatricians, neurologists, psychiatrists, physiotherapists, healthcare providers and research staff in the field of gerontology. In addition to the Parkwood Institute seminar, the seminar lecturer is also invited annually to present as part of the Clinical Neurological Sciences Rounds at University Hospital. 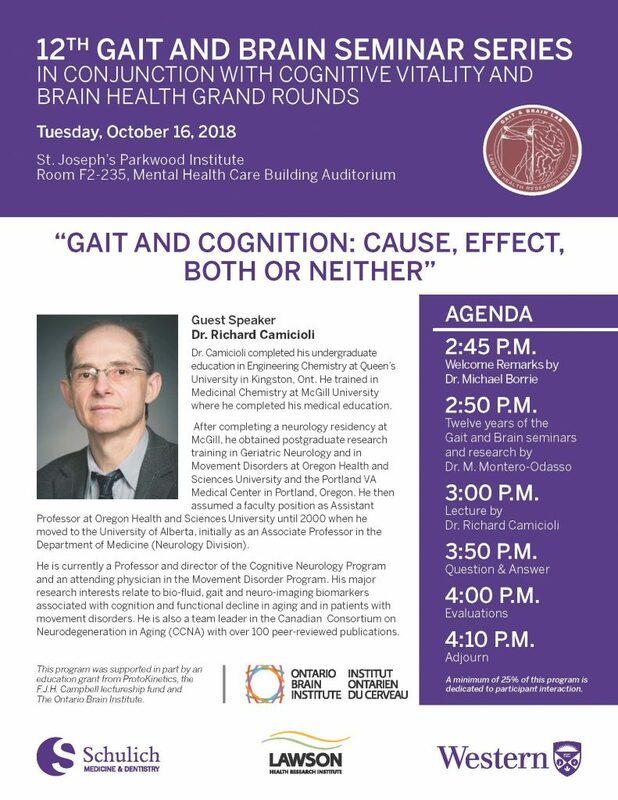 The 12th annual Gait and Brain Seminar was hosted at Parkwood Institute, London ON on Tuesday October 16th, 2018 at 2PM with guest speaker Dr. Richard Camicioli from the University of Alberta. View the full seminar poster here. View the seminar presentation slides here. This event is an Accredited Group Learning Activity (Section 1) as defined by the Maintenance of Certification program of The Royal College of Physicians and Surgeons of Canada, and approved by Continuing Professional Development, Schulich School of Medicine & Dentistry, Western University (1 hours). 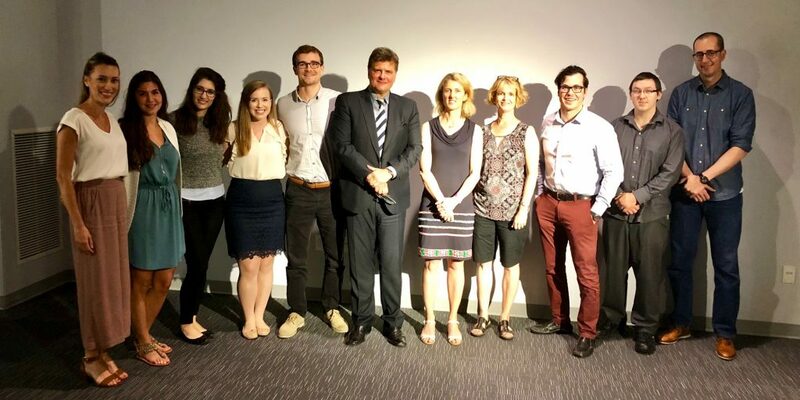 The Gait and Brain Lab welcomed Dr. Michelle Callisaya from the University of Tasmania (Australia) for a special topic presentation on Monday July 16, 2018. More details on this event can be found on our poster, here. 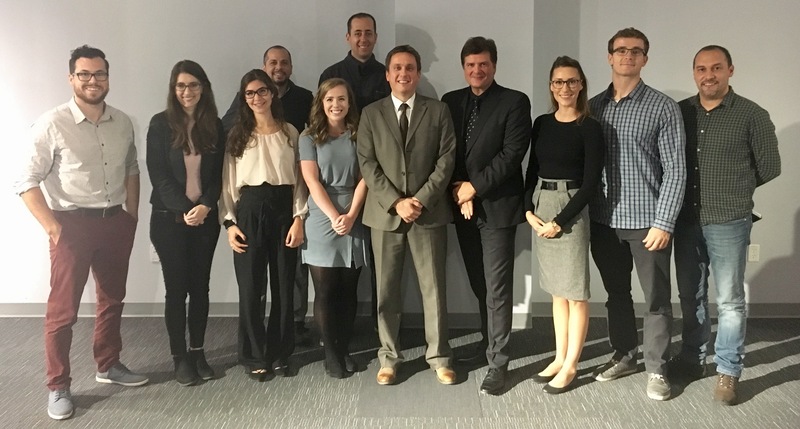 Left to Right: Alanna Black, Shay Nejim, Yanina Sarquis-Adamson, Stephanie Cullen, Josh Titus, Dr. Manuel Montero-Odasso, Dr. Michele Callisaya (guest speaker), Dr. Susan Muir-Hunter, Nick Bray, Korbin Blue, Dr. Frederico Faria. Missing: Joel Mahon, Anish Naidu, Demian Kogutek and Hassan Haddad. View event poster for more details. 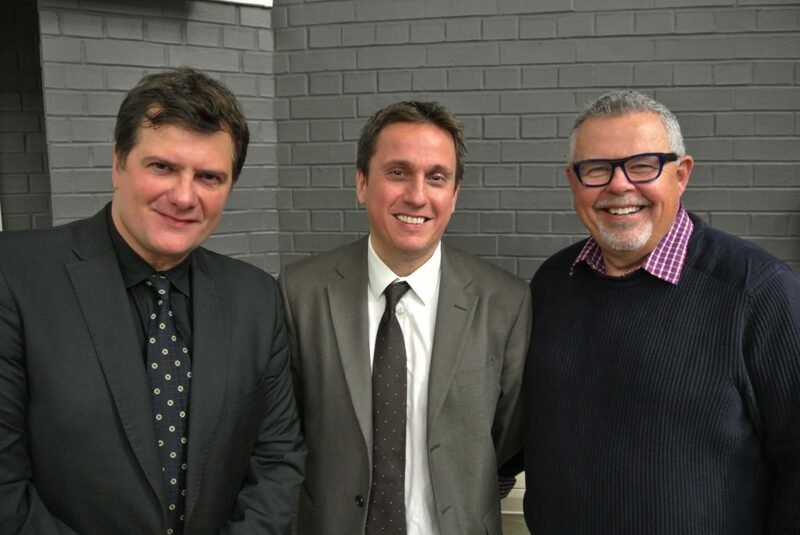 Dr. Manuel Montero-Odasso, Dr. Ervin Sejdic, and Dr. Paul Cooper at the 2017 Gait and Brain Lecture “Engineering Human Gait”. The Gait and Brain team with 2017 Seminar presenter, Dr. Sejdic! 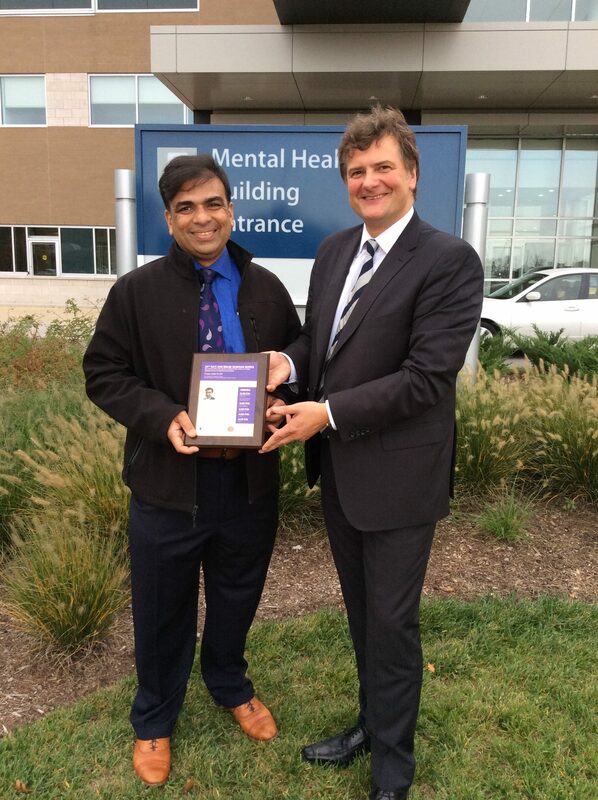 Part 10 of the Gait and Brain Seminar Series at Western with international guest speaker Dr. Joe Verghese from the Albert Einstein college of Medicine in Bronx, New York was held October, 2016. This seminar is available online here. Time: 2:30 pm – 4:30 p.m.
Topic: Gait and Cognition. Lessons we learned 10 years later. 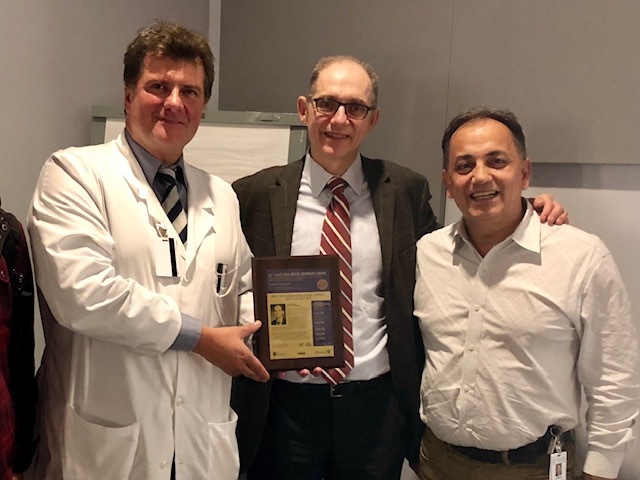 As part 9 of the Gait and Brain Seminar Series at Western we had the pleasure of hosting international guest speaker Dr. Nicholaas I. Bohnen from the University of Michigan. You can view past seminars on our YouTube channel.